The setting sun lights up the sky over a portion of Canyon de Chelly in Arizona. I was able to cross off a bucket-list item when I drove across the country to photograph Canyon de Chelly in Arizona recently. Canyon de Chelly (it’s pronounced “shay”, but I suppose it’s really pronounced like “shay-ee” but everyone just shortcuts it to “shay”) is on the Navajo reservation in eastern Arizona, near the town of Chinle. The canyon is quite large and expansive, not to mention photogenic, with a lot to photograph even outside the canyon itself. For this particular image, taken at an overlook called Sliding House, I set up my tripod near the edge of the 700-foot cliff on the south rim of the canyon about two hours before sunset and started to plan out my composition, still not knowing if the sunset was going to be worthwhile, as the sky was quite hazy at the time. Once I had my composition planned out, I had a very pleasant hour or so to myself sitting near the edge of the canyon waiting to see what the sunset would bring. I chose to create this image as a 3-row collage of 7 images per row taken with the Fuji GFX digital camera and Fuji GF 63mm lens. The angle of view of the image is a little over 90 degrees wide and the collage technique ends up “squeezing” the scene a bit (I just made up that term, can you tell?) and resulted in the cloud spanning the sky to curve a bit more than was apparent to the eye. The final resolution of the assembled image is 223.5 megapixels. There is a house at the lower right corner of the image, which provides some sense of scale. At 100% resolution, there appears to be a dog just to the left of the house (but as each image in the collage was taken with an exposure of 1.5 seconds, the dog is rather blurred). The resolution of the image also allows the viewer to make out individual shingles on the roof of the house. The straight lines you may be able to make out in the dirt at lower right and near the cliff in the center of the image are where dry farming is being done by the Navajo who live in the canyon. Taken with a Fuji GFX digital camera and Fuji GF 63mm f/2.8 lens, 21 images were assembled to make the final composite, each image was exposed for 1.5 seconds @ f/26, ISO 100. A combination of a 2-stop and a 3-stop soft-edge neutral density filter was used to bring down the brightness of the sky during the taking of the first 2 rows of images, with the filters being moved between the first row (all sky) and the second (sky + canyon walls) and removed completely to take the final, bottom, row (all canyon). 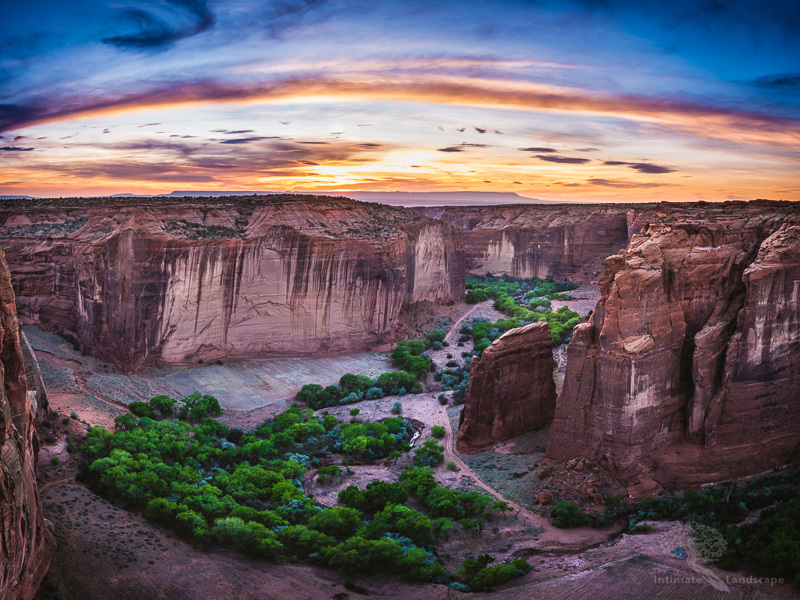 This entry was posted in Landscape Photography, Southwest, technique and tagged Arizona, Canyon de Chelly, collage, desert, landscape, multi-row panorama, Sandstone, sunset.